I lingered round them, under that benign sky; watched the moths fluttering among the heath and hare-bells; listened to the soft wind breathing through the grass; and wondered how anyone could ever imagine unquiet slumbers, for the sleepers in that quiet earth. —Emily Brontë, Wuthering Heights, vol. 2, chap. 20. There was another sigh, close at my ear. 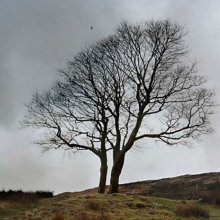 I appeared to feel the warm breath of it displacing the sleet-laden wind. I knew no living thing in flesh and blood was by—but as certainly as you perceive the approach to some substantial body in the dark, though it cannot be discerned, so certainly I felt that Cathy was there; not under me, but on the earth. —Emily Brontë, Wuthering Heights, vol. 2, chap. 15. 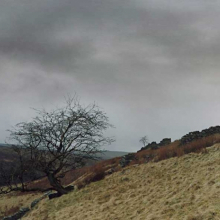 Wuthering Heights is the name of Mr. Heathcliff’s dwelling, “Wuthering” being a significant provincial adjective, descriptive of the atmospheric tumult to which its station is exposed in stormy weather. Pure, bracing ventilation they must have up there, at all times, indeed: one may guess the power of the north wind, blowing over the edge, by the excessive slant of a few, stunted firs at the end of the house; and by a range of gaunt thorns all stretching their limbs one way, as if craving alms of the sun. —Emily Brontë, Wuthering Heights, vol. 1, chap. 1. 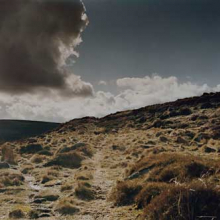 Ghosts, Sam Taylor-Wood’s 2008 photographic exploration of the Yorkshire Moors, was inspired by Emily Brontë’s classic Victorian novel Wuthering Heights, whose famously atmospheric descriptions of the bleak, wild landscape almost turn that locale into the novel’s third major character. For many years Taylor-Wood kept a country house in the same West Yorkshire region where Emily Brontë and her literary and artistic family lived. 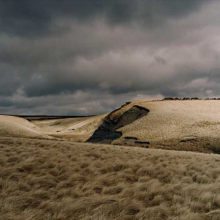 In the ten images from the series to be shown at the Brooklyn Museum, Taylor-Wood captures the stark and haunting character of the windswept moors and gray skies surrounding Top Withens, a ruined farmhouse and the alleged setting of Wuthering Heights. 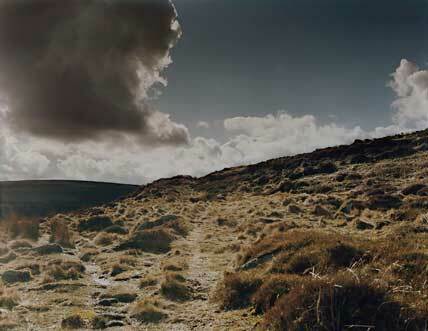 Drawing inspiration from the Brontë sisters’ gothic romantic fiction, the artist followed the footpath from the stone parsonage where the Brontës lived and died up across the moors to Top Withens. Sam Taylor-Wood: “Ghosts” is the latest exhibition in the Herstory Gallery of the Elizabeth A. Sackler Center for Feminist Art, which is devoted to subjects that explore the significant contributions of the women named in Judy Chicago’s The Dinner Party. This exhibition is organized by Catherine Morris, Curator of the Elizabeth A. Sackler Center for Feminist Art, Brooklyn Museum.